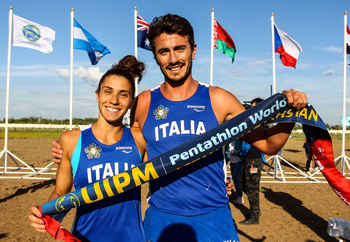 After winning two of the four gold medals on offer during the regular season, it was no surprise to see Italy emerge on top in the Mixed Relay on the final day of the UIPM 2018 Pentathlon World Cup Final. The country’s highest-ranked pentathletes, Alice Sotero and Riccardo de Luca, joined forces to make sure the strong “Azzurri” performances around the world earlier in the year would not be overshadowed. There was more success for Korea on the final day of the championships as Kim Sunwoo and Lee Jihun teamed up to win silver, while Ukraine (Valeriya Permykina & Pavlo Tymoshchenko) beat Belarus (Volha Silkina & Ilya Palazkov) to bronze after a sprint finish. 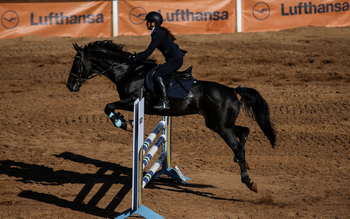 Italy’s success in Astana built on the foundations of a victory by De Luca and Alessandra Frezza at Pentathlon World Cup Los Angeles in April. That followed a season-opening gold medal for Gloria Tocchi and Gianluca Micozzi at Pentathlon World Cup Cairo in March. De Luca (ITA) said: “We feel really good; both of us did our job without stress or fear. “We both found the horses to be a bit tricky [in the individual events] but today it was much better so there were no surprises. Sotero (ITA) added: "I started behind the Korean girl and I tried to get closer to her. My first shooting series was very good but the second one not so good." The silver medal won by Kim and Lee meant that four Korea athletes would return home from the competition with medals after Jung Jinhwa and Jun Woongtae won men’s individual gold and silver respectively. 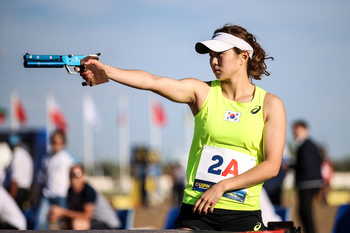 Lee (KOR) added: "My partner did very well in shooting and running to give me the No.2 position at the touch, and I never gave up. De Luca is a good runner and I tried to keep up with him. The silver medal is good, I'm so happy." 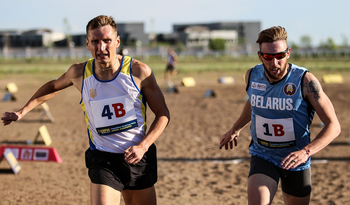 As for Ukraine, it was a relief for Tymoshchenko, the 2015 individual world champion and Rio 2016 Olympic silver medallist, to end the Pentathlon World Cup season with a prize – and it was a hard-earned bronze as he raced Palazkov (BLR) neck and neck to the line. Tymoshchenko (UKR) said: "It was hard here, a very tough course, especially after a season which has not been the best for me. "I hope I will be ready for the European Championships and World Championships. I've got some things in all disciplines that I need to fix, but I hope the next competition will be better." His partner Permykina (UKR) added: “I'm very happy today and I want to thank my team and my coach." 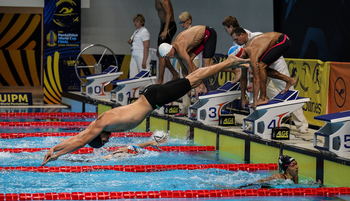 Russia (Gulnaz Gubaydullina & Alexander Lifanov) were quickest in the pool with a time of 1:58.05, closely followed by Belarus (Silkina/Palazkov) in 1:58.62 and Egypt (Salma Abdelmaksoud & Ahmed Elgendy) in 1:59.07. Korea (Kim/Lee) scored highest on the piste with 28V/16D ahead of Argentina (Iryna Khokhlova & Sergio Villamayor) with 27V/17D. Ukraine (Permykina/Tymoshchenko) and Belarus (Silkina/Palazkov) fared well with 25D/19D while Italy (Sotero/De Luca) stayed in touch as they scored 23V/21D. There were two clear rounds in the Riding arena, as Belarus (Silkina/Palazkov) claimed the overall lead and Italy (Sotero/De Luca) got themselves into a position where victory would be achievable. Four teams conceded just seven penalty points: Ukraine (Permykina/Tymoshchenko), host nation Kazakhstan (Ardak Akhidullayeva & Pavel Ilyashenko), China (Bian Yufei & Zhang Linbin) and Japan (Shino Yamanaka & Tomoyuki Ono). Italy (Sotero/De Luca) started 15sec behind leaders Belarus (Silkina/Palazkov) and 14sec behind Korea (Kim/Lee), with Ukraine (Permykina/Tymoshchenko) starting 1sec behind them. Kim (KOR) took the early initiative, but Sotero (ITA) kept her under pressure throughout the two circuits after an excellent opening shoot. Behind them, Silkina (BLR) froze at the opening shoot but refused to let the podium and stayed close to Permykina (UKR) as Julie Belhamri (FRA) moved through the field. De Luca (ITA) became engaged in a very close battle with Lee (KOR), and nothing could separate them until the second half of the final 800m lap when the more experienced of the two athletes, De Luca (ITA), pulled away to win by a margin of 4secs. There was even greater drama in the battle for bronze, as Tymoshchenko (UKR) secured bronze via a photo finish after an intense race against Palazkov (BLR). UIPM President Dr Klaus Schormann said: “I congratulate all of our athletes who performed once again at a high level in today’s Mixed Relay. The Pentathlon World Cup Final was broadcast live in a record 19 countries, and President Dr Schormann added: “This kind of media coverage enables us to transmit the high performances of our athletes around the world, year after year, and raise the profile of our sport and raise interest. “It’s very positive for the future, and for the observers from Tokyo 2020 who were here this week and who can see what we are doing. Tokyo will be the next organiser of the Pentathlon World Cup Final in 2019, as a test event for the Olympic Games, and we have been working very closely with the Tokyo 2020 Organising Committee. The UIPM 2018 Pentathlon World Championships take place in Mexico City, Mexico from September 6-15. Stay tuned to the UIPM website for news and results and check out UIPM TV for video highlights of another memorable UIPM Pentathlon World Cup season.